When I was a Boy Scout, each year all the troops in the Philippines would converge across from Corregidor Island in Manila Bay. It was completely voluntary, but I went many years in a row. During the start of World War II, General Douglas MacArthur was commander of the Pacific forces which were based in the Philippines. On December 7, 1941 Japan did a surprise attack and bombed Pearl Harbor. At almost the same time, though in another time zone, on December 8 they also invaded the Philippines to destroy the American forces and occupy the country. The last holdout of the American forces was a large rock island at the entrance to Manila Bay, called Corregidor, which had been a important fortress to protect Manila Bay for more than 500 years. As the battle waged and it seemed clear the Americans could not withstand the Japanese onslaught. General MacArthur escaped by submarine to Australia with his famous words, “I shall return”. A few days after his escape the American and Filipino armies, under General Wainwright, surrendered to the Japanese. General Wainwright fought as long as humanly possibly which infuriated the Japanese. Even today, it is still the largest surrender of US forces in history. The Japanese forces gathered all the prisoners of war across from Corregidor island and marched over 60,000 men 81 miles to a prisoner of war camp. Many officers were executed. Along the way, if anyone became tired and tried to rest they were shot. Anyone stumbling and tripping was shot. Anyone looking at a Japanese solder was shot or bayoneted and left to die. Sometimes they executed them just for their own sick jokes. The result of this Death March was the loss of as many as ten thousand American and Philippine soldiers. Each year, the American Boy Scouts would re-hike the Bataan Death March in commemoration of the loss and to remember again the sacrifices that these men paid for our freedom. Our march each year would end at a giant cross erected on Mount Samat which was built in honor of those who died. On a clear day, with strong binoculars you can still see the cross all the way from Manila over thirty miles away. Unfortunately, what we do not honor, we forget quickly. At the completion of the march we would receive a medal at the base of the cross. These medals I cherish as much as my Eagle Scout medal because it has great meaning. I made my body suffer, though with all the comforts of modern hiking and camping, to remember the suffering of those who came before me on whose efforts gave me part of the freedoms and comforts I have today. I hiked the Bataan Death March three times and I hope one day I can hike with my son on that same march so he too can know the suffering of those who fought for their land and our freedoms. But some say, why march? Why not just drive along and visit the cross in comfort? 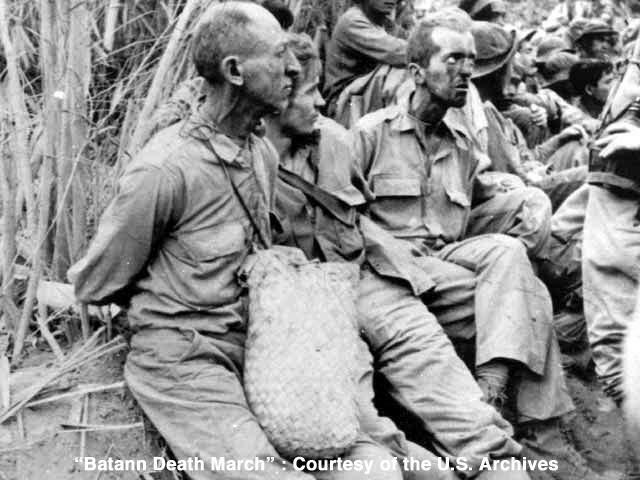 How many of you, before this blog have ever heard of the Bataan Death March where thousands of American and Philippine soldiers were slaughters in absolute brutality? Probably few, but because I have marched it myself, it is something I will never forget. I will never forget the sacrifices and suffering of the those who fought for the Philippines in World War II. When American forces liberated the POW camps, General Wainwright was saved though his heath was broken and his body shattered and emaciated. Though he was the highest ranking POW in American history (3 star General), he was tortured and treated badly. The Bataan Death March as well as years of torture in the Japanese POW camps had played a heavy toll on his body, but he was alive. After Japan was bombed into submission General MacArthur went to Tokyo Harbor to receive the letters of surrender of the Japanese forces. On the USS Missouri General MacArthur stood and watched as he had a skinny and weak General Wainwright receive the unconditional surrender of the Japanese nation. Later he returned to the Philippines and received the Japanese surrender there as well. He treated the Japanese soldiers with respect and dignity. Soon after he was awarded the Medal of Honor, American’s highest military honor and his 4th star. We must never forget the sacrifices which were made by great men and women before us. That is why I march. Thank you Steve for remembering the Bataan Death march and General Wainwright. My father, James Walter Donaldson was one of the New Mexico National Guard defenders of Bataan and Corregidor who survived the march and Japanese POW camps as well as the “Hell ships” used to evacuate the survivors from the Philippines before the war ended. By God’s grace he recovered. The book “Ghost Soldiers” by Hampton Sides is an accurate account of the conditions they endured. Lots of memories from your years in the Philippines. Well written. So many have suffered and died through many generations so that we can live in freedom. Good stuff, Steve. And, I appreciate the memory of your Dad, who fell in a war not his own, among a people he had made his own, following the One Who did the same for all mankind. Will post your article on the FB page. It’s grand to keep remembering their sacrifice. This hike is like visiting Gallipoli (WWI) and the Kakoda Trail (WWII) for Australians. There seems to be a resurgence of young Australians choosing to honour and remember. Perhaps your and your sons trip in honour of your wife is a prophetic breaking open showing how, I hope, the youth of Cambodia will choose to never forget … and honour those that have gone before them. Blessings. Let it be so! Lest we forget. Hi Steve, thanks for this blog. My grandfather was one of the survivors of the march, and Japanese POW camps. I’ve always been interested in traveling to the philippines and hiking the march in honor I my grandfather. I think it would especially be unique to do it with our children someday. Can you give me some more details about where to start, end, is it marked? What are the practicalities of actually doing this? I would most certainly appreciate your insight. I think you would find it a fascinating hike. The trail is marked, but it is a long a main road now. I would recommend hiking, not the full 70-80 mile portion, but a section from Corregidor Island (visit the Island– a massive fortress and explore the barracks, guns and tunnels), then take a boat to the mainland. At the mainland hike from across from corregidor island to the Mount Samat which has a huge 350 foot cross built on top of the mountain as a memorial to those who died. It has a museum as well which would help teach the history of what happened. It is only about 30-40 miles, but enough that you will never forget. There are mile markers along the road as well, but because of the huge cross, you can literally see it your entire walk. . . so you can’t really get lost. And I never got a bloody medal. Too bad you didn’t get a medal! Great you remember! Thanks for the article. My Uncle Rene Gonzales was a survivor of the Death March. I plan on taking my youngest when I retire to the Bataan to hike and camp the trail, all the way to Camp O’Donnell! I may have to enlist your help as an experienced guide!